One a week into the first Type@Paris type design programme. 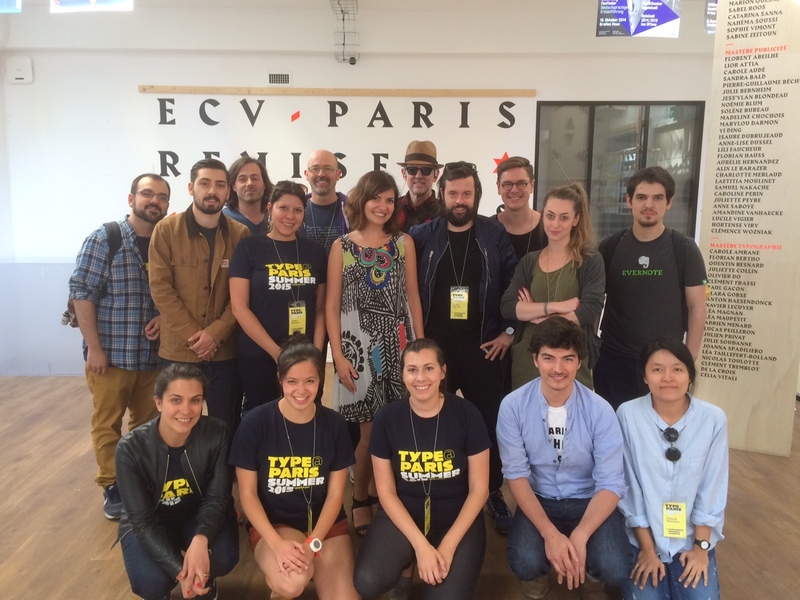 The 16 attendees arrived in Paris few days before we started so they could meet up prior to starting on Monday. The first day was 15 June 2015 and it felt like a new year in a new school – we were all intimated, but only until everyone dived into lettershapes. Julien Priez and myself started the course with an introduction to typeface design. We distributed calligraphy material to all together with Claude Mediavilla’s writing models. For some students calligraphy was a true discovery. During the afternoon and the following morning, Julien pushed the group to use calligraphy as a tool to experiment with and create new shapes and rhythms, a sort of TypeCooker day using calligraphy rather than drawing. Ilya Naumov and Kara Gordon. Julie Soudanne and Franck Jalleau. The afternoon of the next day, Franck Jalleau was the third instructor to join us. Franck’s job was to use the sources that the group had developed with Julien’s guidance as a starting point for a new project. To design lettershapes on tracing paper using pencils. Franck is well know in France for his incredible typeface design skills – how to transform any calligraphic shape into beautiful typographic letterforms. Based on that method, each of the students had to develop a set of glyphs during the afternoon. This day was intense. Our objective was to discover the interaction between the common shapes of various glyphs: from the serifs and terminal endings to stroke contrast and weight. Each Wednesday we host an international guest. The first was Nadine Chahine. In the following weeks, the guest is asked to look at what our group have designed and to offer a design critique. Commenting on and suggesting new methods based on their experience. This is valuable and very different from the core team. The idea of introducing many varied instructors is always a good thing, it helps the students to find their own methodology and particular quality. However, Nadine joined us a bit to early to be able to follow this idea. From the start I very much wanted her on our Type@Paris adventure as Nadine’s work with the Arabic script demonstrates a direct link between writing and typeface design. This is something that our type design teaching methods in France has aimed to do since the end of 60s. Calligraphy and writing helps us to understand the structure, pattern and shapes of letters. Methods developed by the Scriptorium de Toulouse shows real world success, Stilla designed by François Boltana is a direct product from this school back in the 70s. Unlike Nadine’s work and approach, typeface design in the West has been disconnected from writing history for a long time. One can learn type design without the help of calligraphy, many successful typeface designers have shown this. Yet I believe writing is helpful for beginners, you learn crucial things more quickly using writing as a starting point. The opposite is seen in Arabic typefaces where beautiful calligraphy is core to the Arabic script. So, I thought it would be good to ask Nadine to expose to our students to the special relationship between, writing and typeface design, from this culturally different perspective. In fact, she managed to do much more that that. She started the day with a long talk about her PhD research: “Reading Arabic: Legibility Studies for the Arabic Script” As typeface designers we need to be aware that our designs have to be read. So understanding the reading process is just as important as practising with various writing tools, understanding ductus, and learning about typeface history. In the afternoon, Mathieu Réguer joined Nadine to discuss how to start a typeface project. The function of the typeface, the definition of the design topic and its context is very helpful when you start a new type design. As with creating a new logotype, one needs to design for a specific client with a specific need. A meaningless, generic approach is no good. Designing a new typeface requires the same dedication and attention. Wednedays are special at Type@Paris as we are also presenting a series of Talks over the 5 weeks. The Talks take place at a separate venue, called Le Tank, near the Bastille in Paris. Each Wednesday there are two speakers and a facilitator. Our first evening started with a presentation from Tyrsa, followed by Nadine Chahine. On Thursday, Franck Jalleau and Mathieu Réguer returned. Malou Verlomme joined the team for his first course in the afternoon. Type@Paris students worked on their glyphs, improving their lettershapes and structure. It was a difficult day, perhaps more difficult than the first day when new discoveries were made. Everyone knows the feeling of excitement of learning a new skill, keen to work but the hand can’t move as quick as the mind, or heart. All attendees at Bibliothèque Nationale de France. Understanding history of typography is crucial in a type design program. This is why we’ve organized several visits during the course. Various places where we are able to see at first hand the real specimens of the art of typography. On Friday we visited BnF where we entered a room specially set up for us. Here, we enjoyed very rare pieces from their collection such as the [Mainz Psalter,](https://en.wikipedia.org/wiki/Mainz_Psalter the second book printed by Gutenberg of which only 10 copies remain. Examples of Civilité types by Pierre Moreau and Robert Granjon. Fournier books, Baskerville editions and specimens, Jules Didot rare Didot, earlier Bodoni still under the influence of Fournier, etc. We also enjoyed a collection of various specimens from French foundries such a Lamesle, Gando, Fonderie de Laurent et De Berny, Gillé, etc. This overview included more contemporary pieces such as from Marinetti the Italian Futurist. Fraktur type from Mainz Psalter, printed by Gutenberg (his second book). Caractères de Finances by Pierre Moreau. Avertissement, probably set in Fournier. Spécimen Deux points de Saint Augustin, probably extracted from Claude Lamesle. Publius Virgilius Maro by Didot l’ainé. Q. Horatii Flacci by Giambattista Bodoni.